Lit. 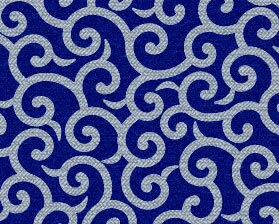 Chinese grass motif. Also called karakusa 唐草. Often used interchangeably with *karahanamon 唐花文 (Chinese floral motif). A foliage-scroll pattern seen on textiles and crafts including ceramics, metal work, and lacquerware as well as sculptural and architectural detailing. Although the term refers to floral and plant motifs introduced to Japan from China, most of the motifs originated in Central Asia, India, Persia, and Arabia. Some came from as far west as Greece and Egypt. The patterns are generally characterized by a flower-and-leaf motif linked by continuous, repetitive, scrolling vines or tendrils. Countless variations developed featuring a wide range of flowers and plants, including the lotus *rengemon 蓮華文, peony *botan karakusa 牡丹唐草, grape *budou karakusa 葡萄唐草 and precious flower *housouge 宝相華 combined with wave-scroll patterns of palmette (of Greek origin) *nindoumon 忍冬文 or arabesques, the continuous vine patterns probably of Persian origin. In Japan, the patterns first appear on extant objects from the 8c, with many examples found among the treasures of the *Shousouin 正倉院. The motifs were then further adapted to Japanese taste in the Heian period especially for dyed textiles *yuusoku mon'you 有職文様. The more exotic motifs often were replaced by flower and plants commonly found in Japan, such as the plum (prunus), wisteria, camelia, chrysanthemum, bamboo and vine sasatsuru mon'you 笹蔓文様, pine, or paulownia kirikarakusa 桐唐草. The motifs were used extensively on silk brocades, damask, and later were adapted for stencilled textiles. From the 17c on, karakusa designs were used to decorate a wide variety of clothing, and cotton futon 布団, as well as furoshiki 風呂敷 fabrics. The designs varied from fine to small to medium-sized patterns. Other variations to note are: cloud-scroll motif unki karakusa 雲気唐草 a double clove motif kutsuwakarakusa 轡唐草 or a type of vine scroll pattern that almost forms a circular pattern wanashi karakusa 輪無唐草.